Watch This Adorable Pup And The Very Many Shenanigans He Gets Up To! Seasoned Moms and Dads of Beagle pups will know that these energetic and curious pups can and will get into all sorts of trouble. They just happen to have that perfect mix of curiosity and smarts to power that amazing nose of theirs, allowing them to poke their heads where they really shouldn’t! 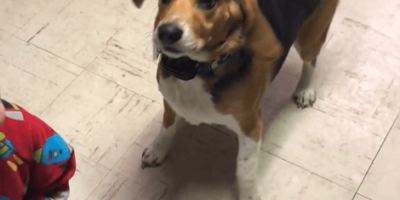 Despite this, everyone loves their pups anyway, just like the parents of Izzy the Beagle love this adorable little pup and the very many shenanigans this pup gets up to! Watching this video montage of Izzy, it is clear to see he is very beloved by his Mom and Dad – even if they aren’t a big fan of him hogging the whole blanket and sofa! Either way, this is obviously a very happy pup that brings in so much love and joy into his family’s life. Just look at the smiles that everyone has in this video! This Adorable Pup Is Too Excited To Visit The Local Dog Park! Check This Out! Whenever This Adorable Pup Greets Guests, She Always Brings Them Some Toys!